CNN iReporter Abe Blair, a professional photographer, www.blindmanphotos.com shot pictures of the Perseid meteor shower over Crater Lake, Oregon for six to seven hours in August 2012. Skywatchers set their alarm clocks for the early morning hours Thursday when the annual Quadrantid meteor shower peaked. Meteor watchers could have expected to see 60 to 200 meteors an hour streak across the sky, according to NASA, but if you found that visibility was low, blame it on the moon: NASA warned that moonlight could make seeing the Quadrantids harder. 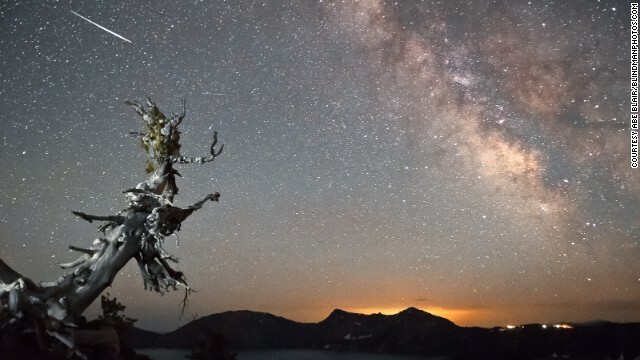 Bill Cooke, the head of NASA's Meteoroid Environment Office, said by e-mail that the shooting stars would be visible after about 11 p.m. in each time zone in the United States, with the best viewing time from 3 a.m. until dawn. Now that the shower has peaked, skywatchers with clear, dark skies may be able to see a few more meteors around 11 p.m. EST.